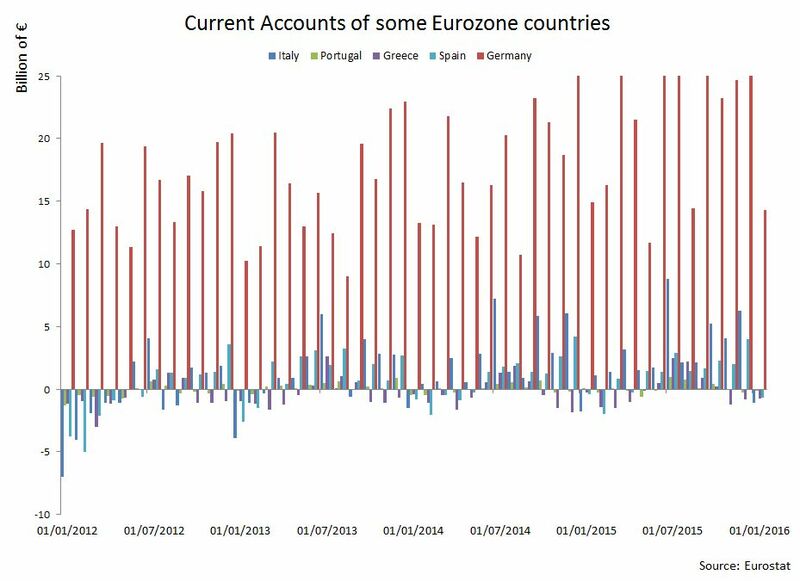 The ECB T-LTROs and the QE efforts are fueling significant outflows toward the core countries, driven by the non-banking sector. 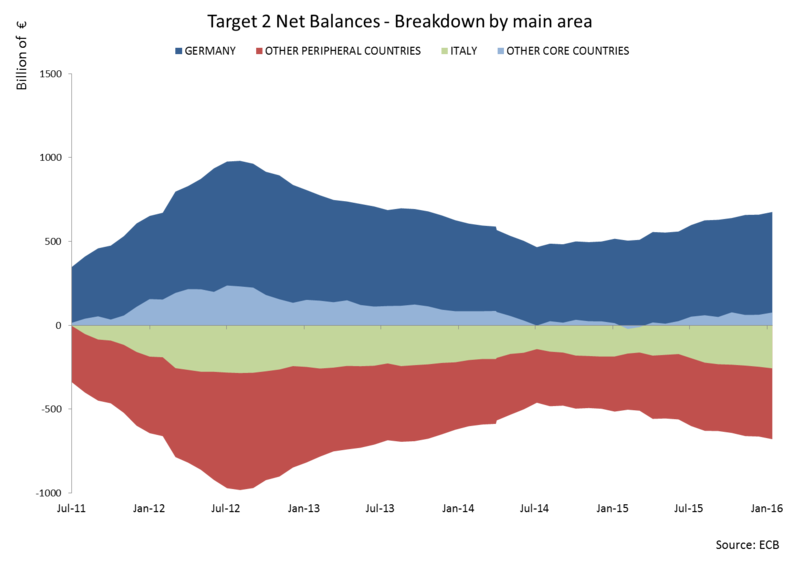 Net balances in the Eurozone continue to widen as capital flows from the periphery to Germany and other core countries. Much of the convergence in net balances that took place between 2012 and 2014 has reversed. As for the underlying reasons, we’ll show that empirical evidence points mainly to the combined effects of the new ECB programs of monetary expansion (T-LTROs and Quantitative Easing). As of March of this year, Italy reported its largest Target 2 net deficit 2012 (€ -263 billion), followed closely by Spain (€ -262 billion) and Greece (€ -95 billion). Germany’s Bundesbank saw its surplus grow to over € +600 billion once again (see Figure 1). The ECB itself has seen its deficit widen to € -90 billion due to quantitative easing purchases (see Figure 3). Around 10% of QE assets are risk-shared between Eurozone countries and thus are accounted as an ECB “debt” towards National Central Banks (NCBs). This unusual accounting confirms that, also because of complex technicalities involved, a clear explanation of the driving components of this central banks' accounting method continues to prove elusive. Even the same ECB is explicitly warning not to infer bold assumptions from analysis of these data since simplistic explanations could lead to wrong conclusions. Some academic research on the importance of Target2 balances has progressed considerably from the seminal but disputed work of Sinn (2012). The Sinn research has the merit in attracting attention on the relationship between the current accounts and the Target2 balances of Eurozone countries. A surplus in the current account should lead to a positive Target2 net balance, and vice versa. In this perspective, the Sinn research considers the Target2 balances in terms of a “stealth bail-out” of peripheral countries by the creditor central banks. According to Sinn, in the case a “debtor” central bank would leave the Eurosystem, the Target2 net balance would become immediately payable. A subsequent default of the debtor central bank would turn into a net loss for the Eurosystem to be absorbed jointly by all the remaining members (risk mutualisation or risk-sharing). Whelan (2012 and 2014) contested this view in many papers, pointing out that any central bank can always operate with “negative equity” (in other terms it could offset losses "printing money", without fiscal transfers from the taxpayers). Now it seems understood (Szécsényi, 2015) that Target2 assets and liabilities could eventually lead to losses in case of a Euro break-up, but these should be a lot less than the raw net imbalances suggest. At the present, a large part of the financial community seems to acknowledge that diverging net balances in the last two years are driven by purely financial transactions. 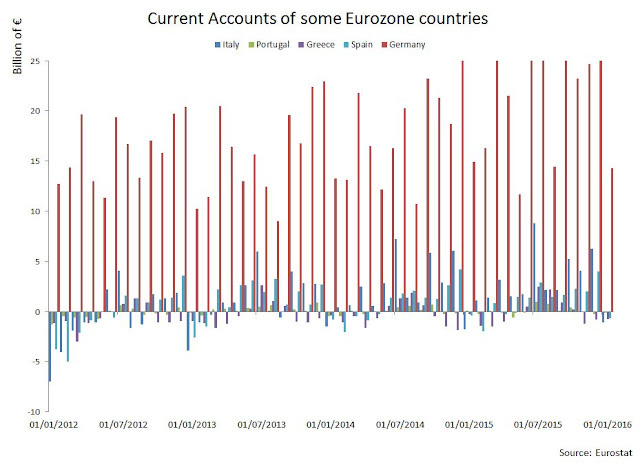 The current accounts of Eurozone countries are mainly in surplus (see Figure 2) due to the depreciating Euro and the compression of the level of prices and wages in the periphery (i.e. a phenomenon also known as internal devaluation). Hence, it could be inferred that the intra-European trade between Germany and the periphery (the Sinn hypothesis) is not the leading factor in explaining Target2 net balances. Digging deeper, it’s interesting to highlight also the strong correlation between the size of the ECB balance sheet and NCBs Target2 numbers. When the ECB inflates its accounts via expansionary measures, newly created money flows towards Eurozone banks that use it to regulate different kinds of transactions. When they are settled and accounted, these operations produce variations in the Target2 net balances. Let’s investigate the Italy’s case. 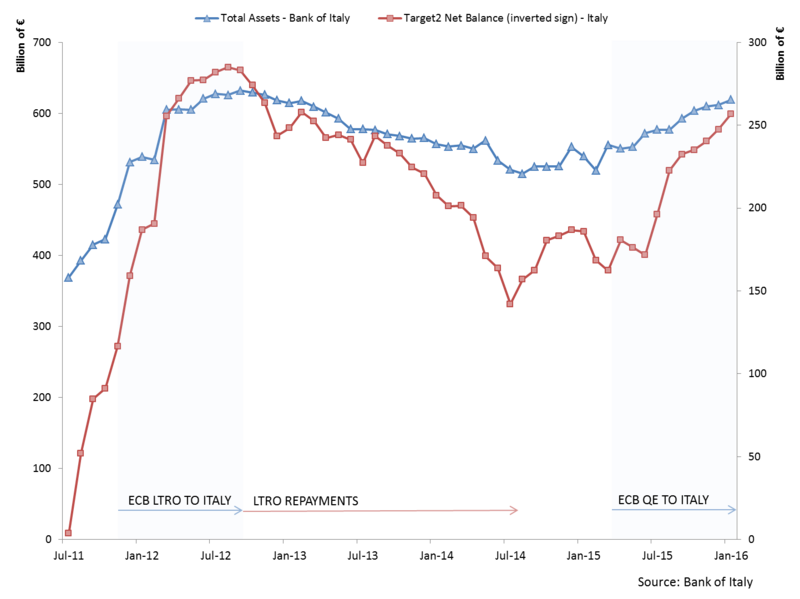 As Figure 4 clearly depicts, Italy’s Target2 net balance and central bank balance sheet show a 96% correlation between 2011 and 2016. In the pursuit to understand movements in Italy's Target2 net balance, a detailed decomposition has been calculated by exploiting financial account data from the balance of payments (see Figure 5). The reconstruction has a good degree of precision, with little unexplained residual flows (the orange bars). In 2011 and 2012, core Eurozone banks sold significant amounts of Italian government bonds on the secondary markets because of an augmented perception of Italy’s credit risk (the green bars grew quickly). 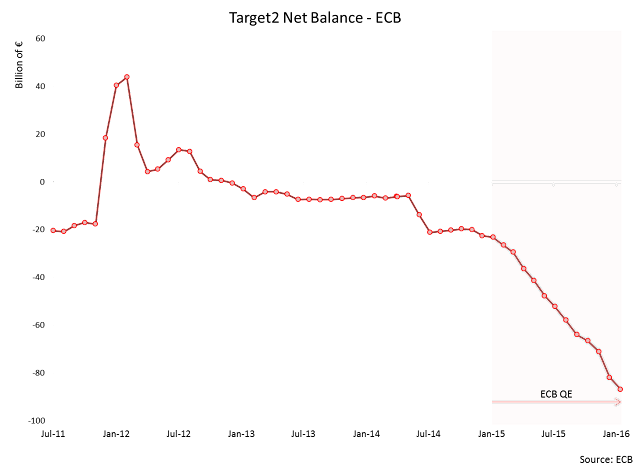 Those bonds were then purchased by Italian banks, which increased their exposure to national public debt. At the same time, German banks were deleveraging from long-term commercial credit exposure to Southern Europe. 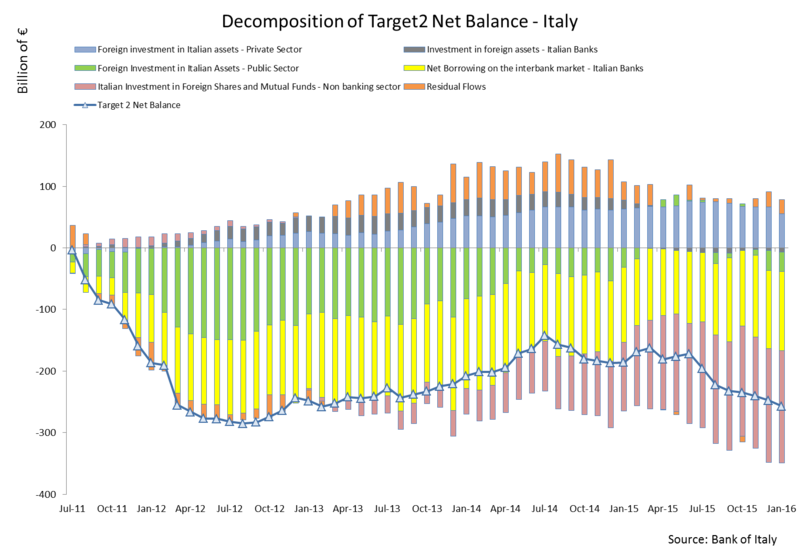 Net borrowing by the Italian banks on the Euro area interbank market also decreased markedly, due to the substantial reduction of deposits abroad and the missed renewals of existing loans. 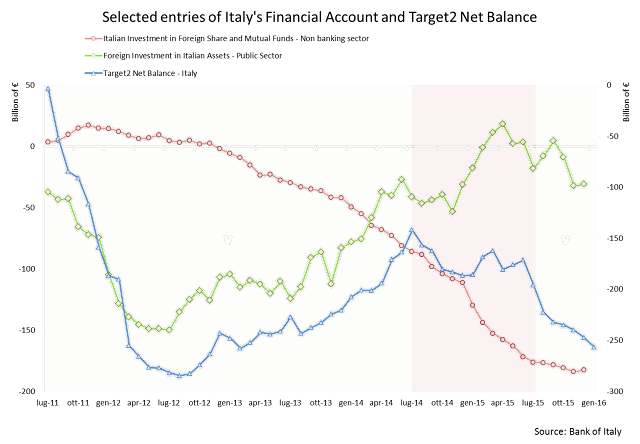 These phenomena (together with a progressively higher cost of financing) were signaling stress on the Italian banking sector’s funding practices (the yellow bars). Together, this led to large capital outflow from Italy to the Eurozone core (denoted with a positive sign in core Target2 accounts; vice versa for Italy). The ECB’s LTROs and other unconventional measures have supplied over € 1 trillion to the Eurozone banks (€ 270 billion to Italy alone) that have been employed to finance the capital flight and transfer risk from the German banking system to the ECB. When LTROs repayments began in 2013, the ECB balance sheets gradually deflated along with the Target2 net balances. Foreign investment in the Italian public sector resumed, though it did not reach previous levels. The missing amounts were partially compensated by a positive influx of foreign money in the private sector (sky blue bars). The divergence returned in June 2014 when Mr. Draghi launched the new T-LTROs in an effort to revive the sluggish Eurozone credit growth. In March 2015, PSPP’s launch accelerated the growth of ECB assets and had widened the spread between Target2 net balances. 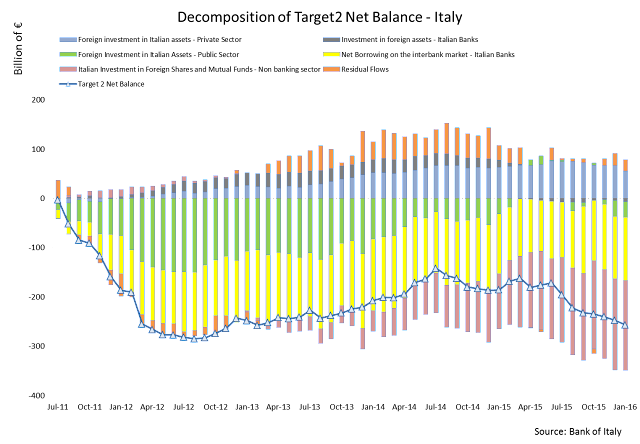 New money flows (TLTROs loans and revenues from the selling of government bonds) reached Eurozone banks but only partially were employed to increase the exposure on national government bonds. A new source of capital flows has emerged and become the primary driver of Italy Target2 negative net balance: a shift in Italy’s private non-banking sector from government and banking bonds to foreign shares and mutual funds. 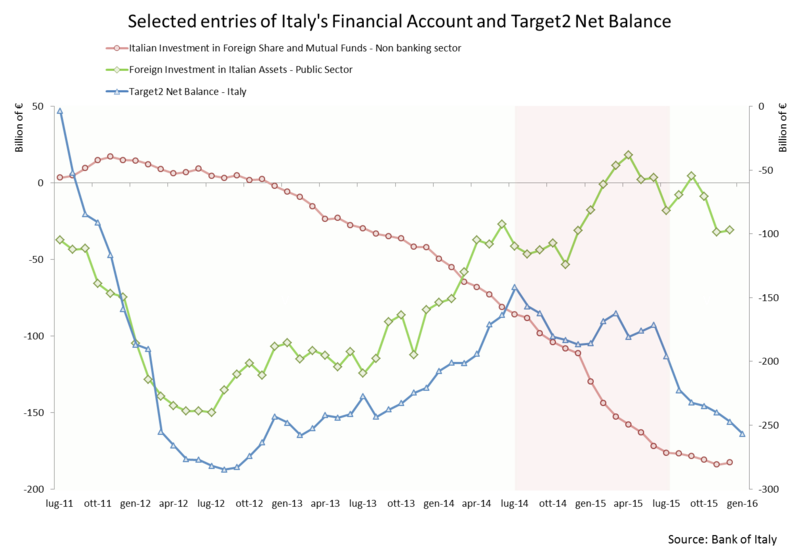 Looking closer at Figure 6, one can infer that the Target2 net balance (blue line) was only affected by the sell-off and the subsequent repurchase of Italian government bonds (green line) until June 2014. 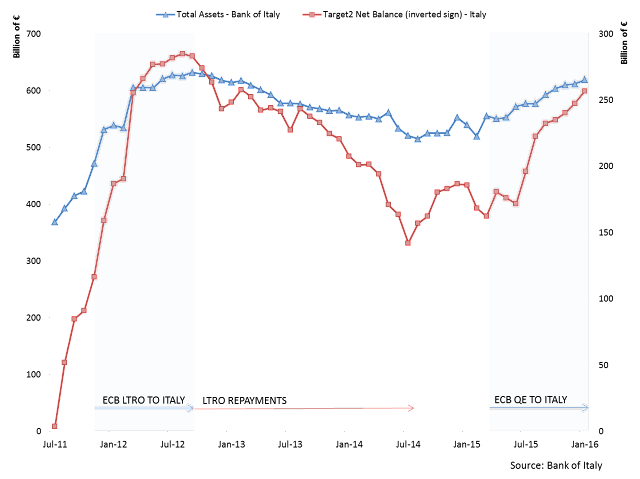 Afterward, foreign investment by the non-banking sector (red line) played a larger role in dragging down the Target2 balance. Moreover, the last few months of decline could be attributed to a renewed – albeit moderate – flight from government bonds. As of the beginning of 2016, over € 180 billion has shifted from Italy towards mutual funds located in Luxembourg, Netherlands and Germany. Only 20% of them can be traced back to Italian entities (i.e. round trip funds). The hunt for yield in a unprecedently low-interest-rate environment can only explain part of this sustained capital flight towards Northern Europe. Subtle but persistent redenomination risk (the risk that a euro asset will be redenominated into a devalued legacy currency after a partial or total Euro break-up) affecting Italian assets. Moreover, the fear of adverse effects of the bail-in regulation that came into effect in January 2016 may have had a meaningful role in explaining this massive portfolio readjustment by the private non-banking sector. Publication of TARGET balances (2015) https://www.ecb.europa.eu/pub/pdf/other/eb201506_focus04.en.pdf. Minenna et al. (2016 - forthcoming) “The Incomplete Currency: The Future of the Euro and Solutions for the Eurozone”, Wiley. Sinn H.-W., Wollmershäuser T. (2012b), “Target balances and the German financial account in light of the European balance-of-Payments crisis”, CESifo Working Paper No. 4051, December.